With Mac OS X 10.6.6 update Apple has opened the Mac App Store. 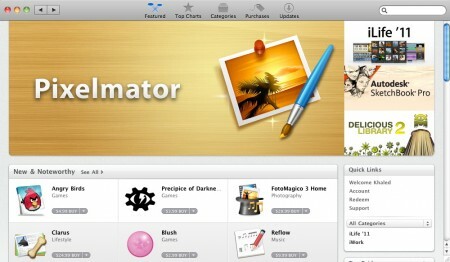 Now customers can find and install Mac applications just like the iOS App Store. Just install Mac OS X 10.6.6 and after restart you can find the App Store icon in the dock and in the Applications folder. You can also launch the App Store by clicking the Apple logo in the menu and choosing App Store. When you launch the App Store you will be asked to login, you can use your existing iTunes store account or create a new Apple ID. Of course there is a Saudi Arabian Mac App Store. In a press release Apple announced that their iLife ’11 apps are available in the App Store for $14.99 for each of the following: iPhoto, iMovie and GarageBand. iWork apps are sold for $19.99 each: Pages, Numbers and Keynote. Aperture 3 is available for purchase for $79.99. Here is Apple’s press release. CUPERTINO, California—January 6, 2011—Apple® today announced that the Mac® App Store℠ is now open for business with more than 1,000 free and paid apps. The Mac App Store brings the revolutionary App Store experience to the Mac, so you can find great new apps, buy them using your iTunes® account, download and install them in just one step. 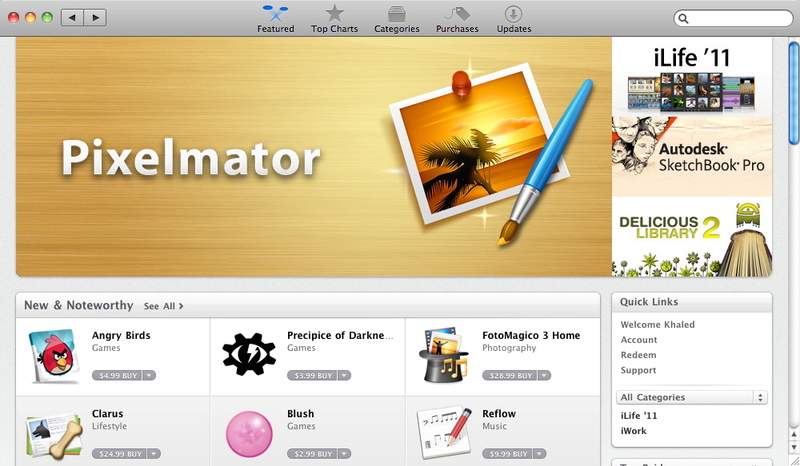 The Mac App Store is available for Snow Leopard® users through Software Update as part of Mac OS® X v10.6.6. I have a US iTunes account opened as per an helpful articles posted on saudi mac. Now, I routinely use that for iPhone and apple tv. I redeem iTunes cards periodically and have been using it for over 2 years without a hitch.